NB Online's resident freelance journalist, Radhika Holmström, investigates what support is out there for Glasgow's black and minority ethnic community with visual impairment. “Getting to know other Africans with visual impairment with whom you can share your problems and understand what you are going through gives you more confidence to be cheerful and get up and go. I feel more confident and hopeful to cross the next bridge of challenges,” says Emmanuel. 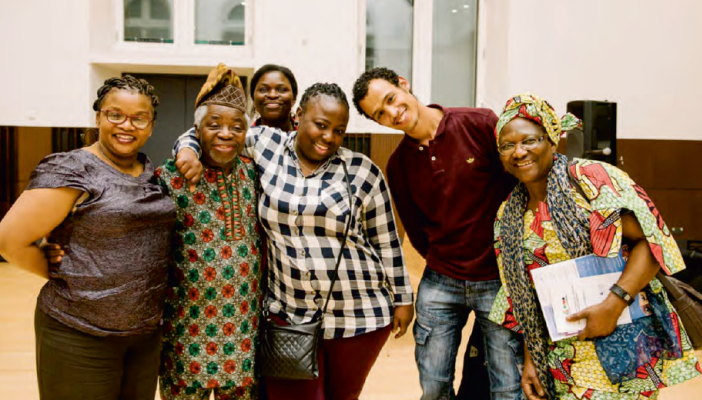 Emmanuel, who comes originally from Nigeria, is a member of the peer support group ‘See No Borders’ which is itself an offshoot of the You Care Eye Care (YCEC) project set up in 2014 by RNIB Scotland. This is a self-management initiative for 15 black Africans with visual impairment who live in the Glasgow area. It aims to support people in becoming more independent, and to finding their way through the maze of services from both the statutory and voluntary sectors, that can help them with their eye condition and with the other issues they face (many are refugees or asylum seekers): from the benefits they’re entitled to, to housing issues, to mobility training. And although it operates on a fairly small scale it is an example of the type of work with black and minority ethnic (BME) groups that makes an important difference. Between the 2001 and 2011 census, the African community in Glasgow increased dramatically, by 400 per cent. As a result, there was a marked increase in the number of African people presenting at ophthalmology services with late stage eye disease. YCEC sees people with a range of eye conditions, but two in particular stand out. It has been widely acknowledged for years now that open-angle glaucoma is more widespread, and develops earlier and more aggressively, in people of African origin. Researchers have identified a number of genes linked to glaucoma and/or to high pressure within the eye (which is associated with glaucoma, though is not inevitably connected). In addition, there’s a higher prevalence of type 2 diabetes in of African, African Caribbean and South Asian descent, which often leads to eye damage because high blood sugar levels can weaken delicate network of blood vessels supplying the retina. YCEC followed an initiative designed for the local Pakistani community. However, Glasgow has a large, high-profile Pakistani population, including many people who were born in the city. By contrast, the African community is smaller and much less established – as the census shows, many people only arrived in the past 15 years, and a significant number are asylum seekers or refugees, which makes their stay (and their entitlements) even more uncertain. The major barriers facing most of the YCEC clients are even greater, so it is easy to see why vision services would be low on their list of priorities. Social isolation has been a huge problem, especially because a number of people do not speak English well and did not initially have adequate translation services; this in turn meant that people did not have enough accessible information about their appointments. In addition, clients who are refugees or asylum seekers are often unclear about what services they might be entitled to – and most do not have a computer either. The focus on those 10 meetings is on ‘self-management’ – learning to take charge of their own needs. Probably the most important result has been greater confidence, which has made it possible for clients to work out what they want to do, and start embarking on it. One, for instance, has undertaken the thee-day media training course offered by RNIB’s Connect Radio, and intends to set up her own social enterprise. Another has signed up for mobility training with the sensory impairment team. A third, whose confidence was so low that she did not feel up to topping up her phone or using her washing machine unaided, is now able to do so: the kind of small result which has a huge effect on daily living. In September 2015 clients also set up ‘See No Borders’, their own peer support group. This meets every month, with speakers from different health and social care organisations presenting on topics such as emotional well-being, vision and the brain, and storytelling. In addition, it obviously provides a very important way for members to get to know each other. Ali Abubakar, 79, is not sure why he was first contacted about See No Borders. Having come originally from Zanzibar to Glasgow in 1961, he had been out of touch with the African community for over a decade. During that period his sight deteriorated dramatically and by the time he was contacted about the new group he had no vision in his right eye and very little in his left. After nine years of living with so little sight, Abubakar has learned ways to cope; but as someone who used to run an art gallery, and who painted and took photographs, vision has always been important to him – and, he explains, being part of See No Borders has helped him to think about visual impairment in a different way. “The word ‘sight loss’ is not completely correct – the sight isn’t lost. It’s given some people courage to know that we have a condition that involves vision, but we haven’t lost all our vision. It’s helped me to think of myself not as blind but as someone whose vision has been affected. Thinking in this way hasn’t taken away the impairment but it has made it easier to live with. You Care Eye Care secures funding till 2019. Find out more.